In the growing market of cloud-based storage providers, it's easy to be overwhelmed. Some people prefer Google Drive, others like Dropbox, still others use private servers. There are no right answers but lots of room for confusion. Dropshare brings some much-needed clarity to cloud-based sharing. It integrates seamlessly with multiple hosting platforms to let users customize their workflow between cloud hosts. The app makes it easy to upload, store, and share information smoothly and securely. Let's take a look at how to get the most out of it. With the newest version of Mojave finally out, we are happy to say that Dropshare is fully adjusted to macOS 10.14. The updated app, Dropshare 5, has lots of perks and new features that will let you fully enjoy the new capabilities of Mojave. Dropshare lets you share files, clippings, and screenshots to a central cloud-based manager. To add files to your clipboard manager, simply drag them to the droplet icon in the menu bar. You can also create a keyboard shortcut that moves whatever you've copied to your clipboard to the cloud storage. You can also capture or record your screen effortlessly. Screenshots and recordings are automatically saved to your manager. Stills can be annotated with Preview, while screen recordings can be automatically uploaded as GIFs. To take a screenshot, simply click and drag to take a still image of part or all of your desktop. In new macOS Mojave 10.14, you can also take screenshots without shadow or save them on your Mac additional to uploading. To make a screen recording, just click the round icon at the top left menu of the Dropshare screen. Then, select zone to capture recording and press big red button. When you're done, select the red button to stop and upload your recording. If there’s one thing Mac users love about Mojave (although it’s only one of many awesome features), that should be the Dark Mode. Dropshare 5 introduces the new interface where users can choose to adopt a light or dark appearance. In addition to a more flexible interface, the users also get brand new landing page designs to choose from. When you're ready to share what you've uploaded, simply click the link icon next to the file in the manager. This will copy an access URL to your clipboard that you can send to whomever you'd like. The app also includes security features that allow you to create expiring and password-protected URLs. For those who seek improvements in branding, editing, and tracking links, Dropshare has the great news. The app introduces a native integration with rebrand.ly URL Shortener. Apart from that, improved Share Extension will help you make the sharing process even more seamless. Another important addition to Dropshare is support for Dropbox uploads. Not only do you get the freedom to upload any number of files, multipart uploads to Dropbox, S3 and Dropshare Cloud now support files of virtually any size. To ensure nothing gets lost in the shuffle, Dropshare introduced New Upload History with filters, search and export functionality. So as you’ve noticed, it’s all about making things easier. URLs in your Clipboard will now be shortened for your convenience and you also get Improved Keyboard Shortcut for Clipboard Uploads. For security’s sake, Google Drive uploads are now set to "anyone with link" instead of "anyone on the web" by default. Dropshare has its own hosting service, Dropshare Cloud, available for free to Setapp users. To align it with third-party hosting services like Dropbox and Google Drive, Dropshare Sync has been used previously. In Dropshare, the sync is replaced by seamless iCloud synchronization for even more convenience. Dropshare magnifies your file-sharing power. For those who use the Setapp version of the app, Dropshare offers a complimentary plan of 10 GB free storage and 20 GB transfer. The plan will be redeemed automatically when you open the app via Setapp and sign up for Dropshare Cloud. The more you customize your Dropshare, the more it can do for you. Keyboard shortcuts help make the process smooth and effortless. 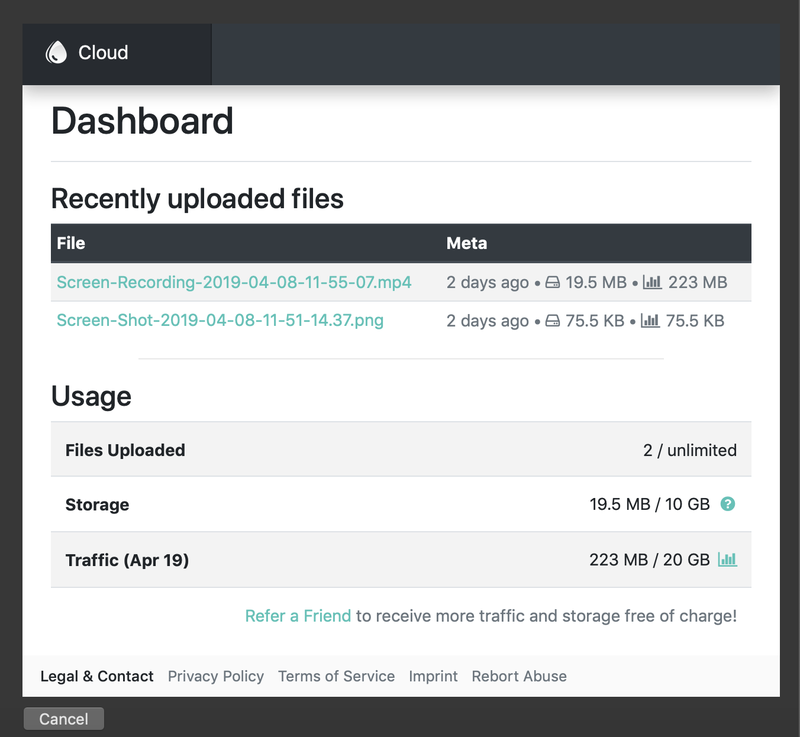 Whether you use a single cloud hosting service or alternate between several, this app will help you keep those connections in one easy-to-find place. How to manage iCloud storage on a Mac?